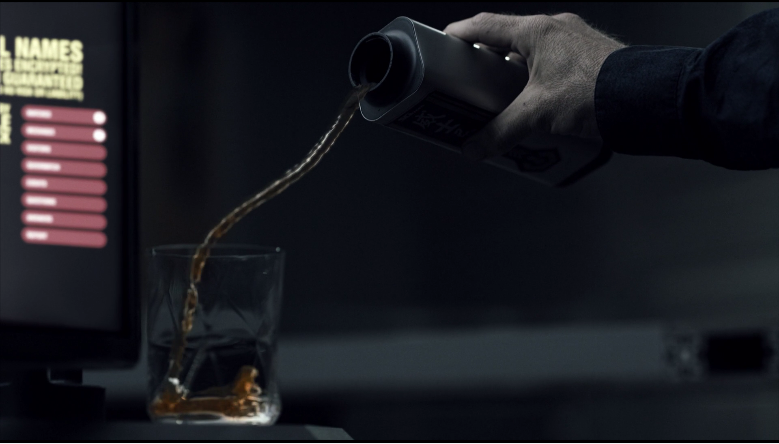 Can somebody explain to me the "behaviour" of the wine-looking liquid Miller fills his glass with toward the end of the episode? Is there some weird centrifuge effect going on on the station or what? Ceres and Eros spin at a measly 1/3g. Doesn't hold atuff down as well as Earth gravity (1g). Still, as seen on the picture below, the liquid seems to be running in a "S" shape instead of the expected parabola. A lower gravity should just make the parabola flatter, shouldn't it? It may be the momentum of the liquid distorts the stream shape. It's Coriolis forces. Short spin arm (diameter of the full arc) causes there to be a steeper gradient of acceleration per increment of distance away from the center. Your feet would have noticeably more "weight" than your head. As thigs "fall" away from the center of spin, they move through that accelleration gradient at a discernible rate. You'd have to pour your drink from a few points spinward to have it hit the cup. You can also get weird S-Curves that way, as minor fluctuations get magnified by the daffy angular momentum of a column of fluid. Answer, of course, is longer spin arms ( http://www.artificial-gravity.com/sw/SpinCalc/ ). But Ceres only has *so* much diameter to work with.